This is a quaint fishing village on a small harbor. A quiet ambiance most of the time, this one is scratch built to put you right to sleep (and then wake you up again!). Waves lap gently at the creaking and squeaking wharf as distant buoy bells rock to the tune of an even more distant fog horn. Listen closely and you may hear activity in this small fishing village... but not much. The water and wharf are the show here, but don't tell the seagulls that! 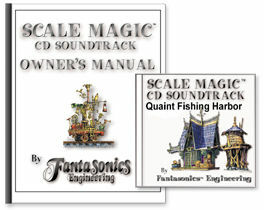 The CD includes both day and nighttime soundtracks in our proprietary scale magic imaging.